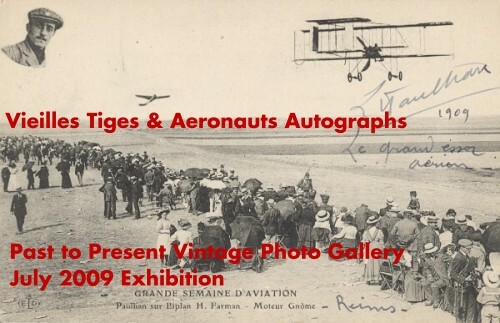 Our July 2009 exhibition features a large collection of autographed postcards from the Collection Am�d�e Bastier, Propri�taire et entrepreneur parisien, pilot aeronaut, owner of balloons Le Limousin and l'Albatros and member of the ACF in 1905. The collection is divided in 2 parts. The first part has about 80 cards written by aeronauts Alfred Leblanc (before he turned his interest to airplanes), Edgar Mix, Nicolleau, Moujardet, Girardon, Bastier... and sent to Amedee Bastier or his wife by the balloonists after landing. The second part has about 120 postcards signed by early aviators, some famous, some long forgotten. Although we have priced each card individually, we would like to keep this collection together and will accept offers for the whole collection until end of july. Pre orders of individual cards will only be confirmed early august if the collection has not sold. The subjects we plan to showcase next are photos by Seeberger Freres (Jules Louis, Henri), World War II Japanese propaganda photos and Business cards of pioneer photographers.